EuroCave’s NEW ‘Vin au Verre’ (wine by the glass) system allows you to offer your customers good quality wines by the glass that you normally wouldn’t open in fear of it deteriorating over the short term. This innovative system means you can serve wine in precise dosages, at the right temperature, without wastage (and boosting profits) whilst beautifully showcasing your wine by the glass offering. Its clever design makes the unit easy to use with an intuitive touch screen control, ideally suited to bar and restaurant use, and lending itself well to tastings. You can even offer self service with a card. 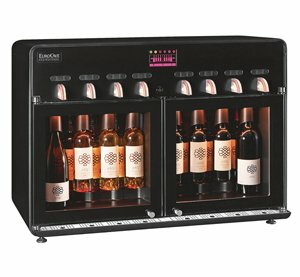 The Vin au Verre wine dispenser can sit free standing or be built in (flush fitted) to bar areas. Beautifully finished with stylish glass doors, this equipment is as aesthetically pleasing as it is functional. Display and serve from 8 open bottles, and store a further 6-8 bottles behind. Serve wines at their ideal serving temperature with two separate compartments that can each accommodate either red or white wine. Each tap pours a precise dosage for wine tasting or drinking (3 different dosage settings). Preserve open bottles for up to 3 weeks eliminating wastage and boosting profits. Ability to connect to cash register or be set up for self service with card. Showcases wine list beautifully with lighting effects, and suspended bottles with no visible tube. Efficient to use: pour wine in 6 seconds and change bottle in 10 seconds. Glass holder allows several glasses to be served at the same time. Quick and easy cleaning system for all 8 taps. Colours: External panels available in 5 different colours. *In accordance with maintenance agreement. EMAIL US or CALL 1800 722 621 for expert advice on this range.